Over at the Volos Acadamy for Theological Studies website there is a report on a recent conference in Athens on NTTC. On February, 22 2016, an International Conference was successfully held at the central building of Athens University (“Al. Argyriadis” Amphitheater), on the general theme: New Testament Textual Criticism: Its Significance for Scholarship, Culture and Church. 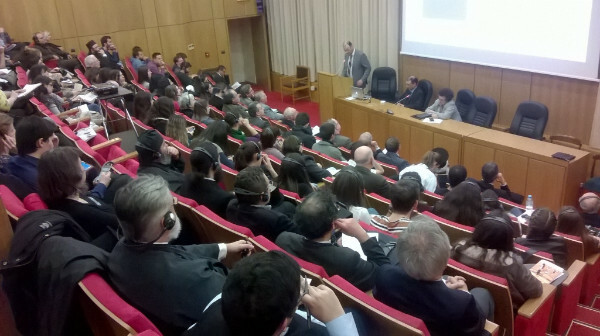 The conference was co-organized by the Dean’s office of Theological School of the National and Kapodistrian University of Athens and the Department for the study of the manuscript tradition of the New Testament of the Volos Academy for Theological Studies, and attended by a vast number of academics and special researchers who are members and contributors to the Editorial Board of the critical editions of the New Testament “Novum Testamentum Graece” (known as Nestle-Aland) and “UBS Greek New Testament”, which internationally constitute the basis for the scholarly study and the translation of the text of the New Testament. Speakers included Klaus Wachtel, Holger Strutwolf, Florian Voss, David Trobisch, Greg Paulson, Stephen Pisano, Simon Crisp, Christos Karakolis. Apparently this was in some way the first scholarly conference being held in Greece on the subject of New Testament Textual Criticism. I’m not sure exactly what that means. But it’s good to see more TC happening in Greece where so many GNT manuscripts are kept. It looks like there was a pretty good crowd too. Full report here. A blog reader has pointed out that this conference also saw the first a meeting of the new Editorial Committee of the NA/UBS. That is historic. I confess that I still don’t understand what the new committee’s role actually is. Also I thought David Parker was a member. Still, exciting stuff. The claim that some methods are more “objective” than others—in particular, the view that decisions based on external data are somehow more “objective” (or at least less “subjective”) than those based on internal considerations—is largely illusory and misleading. With respect to both external and internal evidence, what counts as “data” or “evidence” is a theory-driven decision, and the choice of what data to follow is inescapably subjective. (p. 103 n. 40). Maybe he will permit me to offer a simplified version: there are no text critical conclusions achieved without human judgment. Michael W. Holmes. “The Text of the Epistles Sixty Years after: An Assessment of Günther Zuntz’s Contribution to Text-Critical Methodology and History.” Pages 89–113 in Transmission and Reception: New Testament Text-Critical and Exegetical Studies. Text and Studies Third Series 4. Piscataway, NJ: Gorgias, 2006. This is part 2 of our interview with Chuck Hill. Part 1 is here. In The Early Text of the NT, you suggest that David Parker “gives the impression that concern for the original text is simply a religious phenomenon, driven by pressure from churches who desire an ‘authoritative text’” (p. 4). You point out, rightly in my opinion, that religious belief is hardly the only motivation for seeking a work’s original text. But what is the relationship between a high view of Scripture (as found, say, in the Westminster Confession) and the quest for the original text? Is such a view of scripture viable without the concept of a single original text? Having a high view of Scripture, as you pointed out, is not the only motivation for seeking an original text. I don’t know why anyone would make that assumption. But is a high view of Scripture viable without ‘the concept of a single original text’? The short answer, I suppose, has to be ‘yes’, but it depends, of course, on what is meant by ‘the concept of a single original text.’ You can, of course, make a distinction between the original text (let’s just define it as the text as it left the author’s hands for the last time, with the author’s intent for release) and the ‘Initial text’ or Ausgangstext (the text we reconstruct as the source of all the known readings). But even the ‘Initial text’ is a form of the text that originated with the author. Different compositional stages of a book (e.g., a book before the author added a prologue, or decided to insert new material, etc.) are not different editions of the book, and it just seems like obfuscation to bring them into the picture. The main, possible complication, I suppose, would be if the author did make a second edition (as some people have argued for the text of Acts). Let’s say (for the sake of argument) Paul sent a letter to the Roman church and kept his own personal copy, then later modified his copy in some way, intending to make this revised copy the basis for copies that would be more widely distributed to the churches, perhaps along with a collection of his letters. In this case you could say there are two ‘original’, authorial texts of Romans, essentially two editions. Each of these would have originated with the author with his intention to be ‘released’ or published. Each one, I think we would have to say, was inspired, written by Paul in the exercise of his apostolic ministry. So here we would have two ‘originals’. In my opinion, the natural standard we would be seeking (if we could tell the difference) would be the final version that left Paul’s control, as representing the author’s final, intended ‘original’, even if it was not the ‘original’ original. Or, let’s say that the ‘release’ of a book like Revelation, or even one of the Gospels, for that matter, was marked by the sending out of several ‘initial’ copies as part of the release. What if there were minor scribal differences between them? In this case, presumably there was still one single master copy from which other copies were made, which would be the logical ‘original’. But what if this, or any other, first exemplar itself contained errors that were made and somehow not corrected, in the inscription process? Then the ‘original’ text, or the normative text, would presumably go back to the author’s intention, no matter what happened between thought and words appearing on a page. This is why Warfield, in his book on NT textual criticism, identified the original text as the text intended by the author. You teach in an institution that holds the Bible to be “absolutely and finally authoritative as the inerrant Word of God.” How do you respond to critics who say that such a belief is necessarily restrictive and even incompatible with the academic study of the Bible? Does belief in inerrancy restrict your scholarship in any way? Yes, I’m sure it has restricted the number of stupid things I would otherwise have said. I can’t say I feel restricted in a negative way. Inerrancy can be defined in unhelpful ways but I see it not as ‘a thing in itself’ so much as simply a corollary of a couple of very basic articles of the Christian faith: that God is true and cannot lie, and that Scripture is his word. If we were starting over today, perhaps we would have found another word besides ‘inerrancy’ because it seems so prone to misunderstanding. But it has entered the theological vocabulary and it does have its value – and not to affirm it sounds a lot like not affirming God’s truthfulness. God speaks in a way that is ultimately true, not false. For me, that doesn’t predetermine very much about what the text must say or look like; God might speak, and speak truly, in ways and in forms I don’t expect. Human language (which God seems happy to employ, thankfully, because we are humans) is full of surprises. I think those who have a high appreciation for the divinity of Scripture will often look at a text much more carefully and insightfully than those who don’t, who might be satisfied with (or even eager to take) a shallower and less sympathetic treatment. And, of course, I think we would have much, much deeper problems without such a God who has spoken to us in Scripture. If you had a particularly gifted student who wanted to pursue graduate work in textual criticism or canonicity (or both! ), are there any particular issues you might want to steer them toward? Any you would advise them to avoid? Studies of particular manuscripts are now starting to come into their own, and this is a good thing that should be encouraged in every way. I think the study of textual division is one area that holds a lot of potential (see on next question). Sorting out the issues behind what has been called the ‘Western’ textual tradition, in my view, would be helpful, particularly the relationship between the early Latin and Syriac translations and their presumed Greek Vorlagen. How much of what has been attributed to a Greek Vorlage is really a result of translation technique? I don’t think the Greek fragments of Irenaeus that contain Biblical citations have been adequately analyzed and compared with the Greek manuscripts and the Old Latin translation(s). More work is being done on early patristic appropriations of Scriptural texts, and that is a welcome sign, but more can still be done. More attention could be given to early Christian book collections, of churches or of individuals. There are a number of signs that Christians in the second half of the second century already believed that Scripture consisted of a ‘closed collection’ of books. These could be explored further. I can’t think of any to avoid, except anything that won’t hold your interest for years of study. Dr. Charles E. Hill, delivers the Spring 2016 Academic Lecture at RTS Orlando on the theory of the early development of the NT text. Offering an alternative solution to long held views. Can you share any of your current research projects with us? Of most interest to readers of this blog might be the work I’m doing on textual divisions in early manuscripts. For the Michael Holmes FS I did an investigation of early manuscripts of John, focusing on what appears to be a very early template for textual division, best preserved in P75 and in B. Among other things, I think it indicates that the scribes of Vaticanus probably had access to a very early copy, or copies, of John. My paper at SBL last November (2015) carried the study through to the other three Gospels, and I’m hoping to take this research further. Following up on the work begun in ETNT, I’m working on updating the prevailing theoretical model for the early development of the NT text. 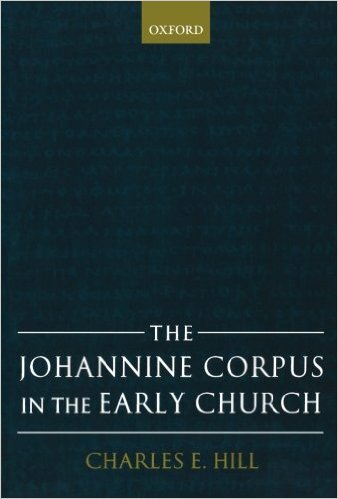 Extending work on the Johannine Corpus (The Johannine Corpus in the Early Church) I’m also working on a book on the composition of John, in which I’m revisiting theories of multiple editions of the Gospel. Also I’m writing something on the socio-theological context of 1–3 John. If I should live long enough, I’m hoping to write a commentary on John. Dr. Hill, thank you so much for your time and experience. In 1973, Eldon J. Epp held a lecture on what he regarded as the “Twentieth Century Interlude in New Testament Textual Criticism” (published in JBL 93 : 386–414). He suggested that there had been an interlude ever since the golden era of the 19th century, which had peaked with the work of Westcott and Hort. A few years, Epp published an article in JBL 98 (1979): 94-98, entitled “New Testament Textual Criticism in America: Requiem for a Discipline,” in which he lamented the contemporary situation of the discipline. The term “interlude,” is of course much more optimistic than “requiem.” The latter suggests the death of the discipline, whereas “interlude” gives hope of resurrection and new life. Call for papers (2016): The NTTC Section is sponsoring two open sessions in 2016: (1) A panel designed to reconsider the periodization of controlled versus fixed New Testament texts. Questions to be considered include: Is it accurate to assume that NT texts, which could be quite fluid early on, became more stable in the post-Constantinian period? Did the identification of particular texts as sacred scriptures impact the transmission of these texts? How? (2) An open panel that welcomes papers on all aspects of the textual transmission of the New Testament. Papers addressing second-century textual traditions, scribal habits, comparative book typology, and the impact of author attribution are especially welcome this year. The Section is also co-sponsoring an invited panel with the International Quranic Studies Association that will compare New Testament and Quranic textual criticism. Description: The unit presents the on-going work on the Editio Critica Maior (ECM), a comprehensive text-critical edition of the Greek New Testament that exhibits the history of the Greek text through its first millennium as documented in manuscripts from the second century until the invention of letterpress printing. It provides scholars engaged in the tasks of exegesis and textual criticism with all the relevant materials found in Greek manuscripts, patristic citations, and early translations. The selection of Greek manuscripts rests on an evaluation of all known primary witnesses, and each of the manuscripts selected is cited completely with all its variants. This opens the way for a new understanding of the history of the text, the more so because all relevant evidence is stored on databases. The primary line of the ECM presents a text based on a careful application of internal and external criteria, streamlined by the Coherence-Based Genealogical Method. Call for papers (2016): The unit presents the work on a comprehensive edition of the Greek New Testament in the making. New Testament scholars are invited to discuss achievements and goals. Call for papers (2016): Papers concentrating on any aspect of textual criticism are welcome, particularly those that deal directly with manuscripts, i.e., papers that work with material witnesses to the text—tablets, ostraca, inscriptions, papyri, majuscules, minuscules, lectionaries. Description: This research group focuses on the textual study and criticism of sacred texts from the ancient Eastern Mediterranean world that later had a global influence; the Old Testament, the New Testament and the Qur’anic text. All three have similarities and differences. They have influenced other writings and at the same time have themselves undergone external influence bearing on questions of interrelationship, orality, textuality and language. Not only the aforementioned characteristics, but also their preservation and the copying as well as the proliferation of manuscripts are of particular interest to textual scholars. 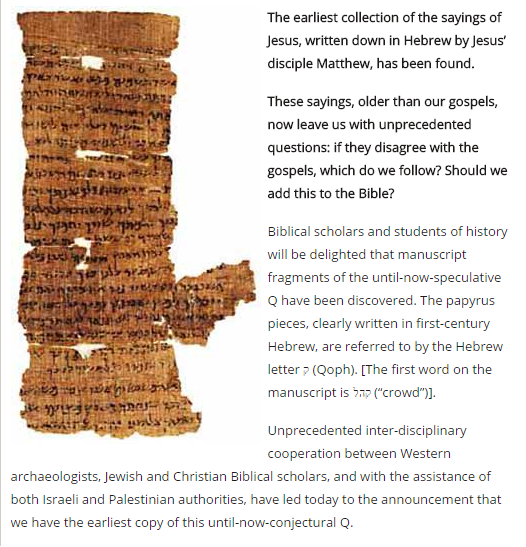 The sine qua non of this research unit for Textual Criticism is the study of the major witnesses to the text of the Old Testament – the Hebrew Bible, the texts from Qumran, the Septuagint, the Masoretic Text – as well as the Aramaic Targumim, the Syriac translations, the Vulgate, Commentaries and others. Of course, also the study of the Critical and the Majority Text, of the versions of the New Testament, as well as the Patristic citations and commentaries, but also Apocrypha and Pseudepigrapha and others. And finally, the research unit includes the textual criticism of the Qur’an, standard text or authoritative text, and the qira’at tradition (that corresponds to different readings); the cultural milieu and context in which the Qur’anic text has been transmitted and used and the tradition of the commentaries. an open session where papers on any topic within the range of the interests of the research group are welcome. a thematic session “Do margins matter?” focused on the structure and content of comments, notes, diagrams at the margins of the manuscripts, with the possibility of finding common elements and interactions between the traditions. The “Textual Criticism of the New Testament, the Old Testament and the Qur’an” research group cordially invites the submission of proposals for papers for the forthcoming EABS meeting in Leuven. Generally the duration of papers to be read should not exceed 20 minutes. Abstracts (no more than 300 words) have to be enrolled through the EABS meeting website until 31st March 2016. More details on dates and abstract submissions please check here. 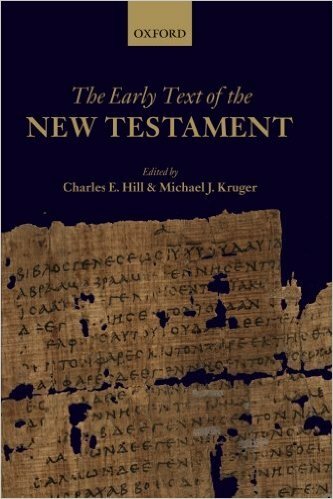 Rationale: The establishment of the New Testament text is a prerequisite for New Testament studies, and the subsequent history of the text (the textual variants) offers windows into the social history of Christianity and the reception of the text by ancient readers and interpreters. There can never be a strict border between the exegesis of the text and the «Wirkunsgeschichte» as reflected in the history of readings and the study of the NT manuscripts. . . .
New Testament textual criticism has experienced a strong development in recent years and is currently a thriving field of New Testament studies, as evident from the number of publications, including editions (Editio Critica Maior, Nestle-Aland 28, SBLGNT) and electronic tools, as well as a significant increase in activity at scholarly conferences. The strong development in the digitization of NT manuscripts as undertaken by institutions worldwide, and the perspective of future digital tools and editions such as the forthcoming digital Nestle-Aland 28 strongly points to the necessity to open a new New Testament textual criticism seminar at the SNTS. Description: The Birmingham Colloquium on the Textual Criticism of the New Testament is usually held every two years in Birmingham, UK. Since the first meeting in 1997, an ever-increasing number of established scholars as well as doctoral students have participated in the 2-3 day programme. The themes have included scribal practice (2007), patristic citations (2011) and commentaries (2015), as well as broader topics. The colloquium traditionally includes an excursion to examine manuscripts in a local cathedral library and a closing dinner with a presentation. Several sets of proceedings have been published in the ‘Texts and Studies’ series (http://www.gorgiaspress.com/bookshop/c-44-texts-and-studies-1935-6927.aspx). Today I received my copy of a new book: D.A. Carson (ed. 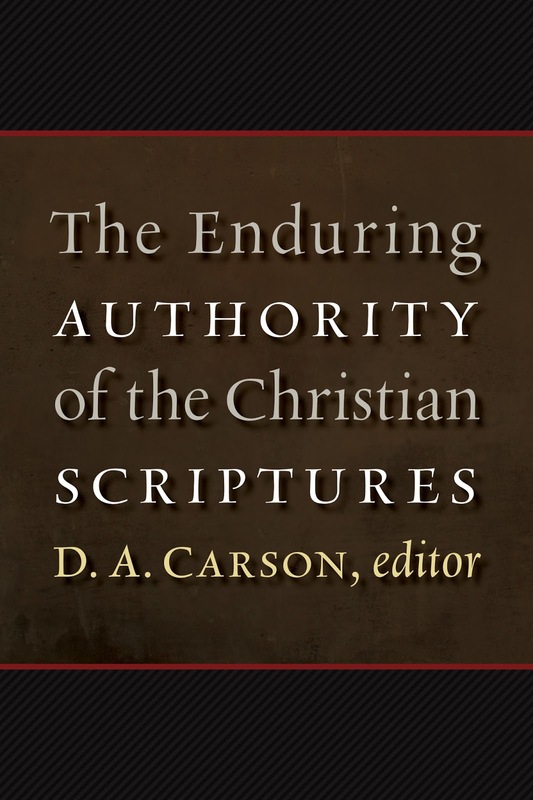 ), The Enduring Authority of the Christian Scriptures (Grand Rapids: Eerdmans, 2016). It is quite a big book (36 chapters and 1,240 pages), so this is not a review, more of an initial reaction and recommendation. For information on the general motivation there is an interesting video of Don Carson on the Eerdmans website, also some discussion on Justin Taylor’s blog where you can see a detailed list of chapters. 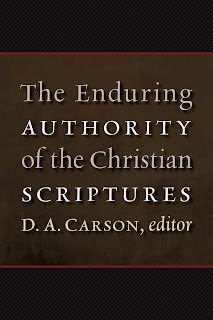 For some early push-back on Carson’s framing of the book see the comments from Nijay Gupta: Why I’m Disappointed with DA Carson’s New Book (for part of the back story see here). The essays I read were all interesting, well-informed, confident that they could defend the authority of the Bible against the challenges it faces. I especially liked Hill’s essay on Scripture in the early church, obviously that is because it dealt with a lot of things I am personally and professionally interested in, but also because it is obvious that Hill has worked in detail and for a long time with the questions he is addressing about this period. So it challenged me to think about the data and the argument. Readers of this blog will enjoy that essay. They will also enjoy Pete Williams’ essay, hopefully this will help straighten out a lot of discussions of the inspiration of the original text of Scripture (readers of this blog will have already figured this out from Pete’s posts). I dipped into some of the history chapters, read all the biblical chapters, enjoyed some of the more theological discussions and completely avoided the philosophical and comparative religion chapters. ‘it is no good defending a text with respect to claims that it never makes’ (p. 387 my italics). So it would have been helpful to have some constructive discussions to articulate what ‘the claims of Scripture for itself’ really are. I had an ironic moment in reading Graham Cole’s very interesting chapter ‘Some Theological Reflections on the Canon’ when he complained about Brevard Childs: ‘the paucity of references in his major work on biblical theology to the role of the Holy Spirit in the production of Scripture is a singular weakness ... 2 Timothy 3:16 hardly figures in his work and 2 Peter 1:21 not at all according to his index of biblical references’ (p. 466). Of course the irony is that this collection is equally lacking in treating these topics. There is practically nothing on the work of the Holy Spirit (in fact the first entry under ‘Holy Spirit’ in the index is ‘inspiration’, but next to it is only blank space, no page numbers! ); the only actual engagement with 2 Tim 3.16 comes in a critique of Karl Barth’s exegesis of the passage, otherwise there are only glancing references which presume rather than demonstrate what it teaches (2 Peter 1.21 does appear in the index, but is not discussed in any substantial manner). The third thing I noticed, building on the first two observations, is that only seven of the 36 chapters deal directly with the Bible. The weight of the whole collection is spread out fairly evenly over the major areas: history, theology, Bible, philosophy, and the helpful new areas of comparative religious issues in relation to the authority of Scripture. But I found it interesting that a book about the Bible’s inspiration and independent authority over the people of God begins not with the Bible itself, but with church history - nine chapters to get the tradition straight before we get to the Biblical chapters. The fourth thing I noticed is that in fact lots of the biblical essays don’t really deal with the inspiration and inerrancy of Scripture very straightforwardly. In fact a lot of them barely deal with the Bible at all (in this I would count Dempster, Long, Williams, and Waltke), but are discussions about background to or secondary discussions about the Bible. Dempster’s essay is about Josephus’ view of the OT canon, arguing that Josephus had a clear and closed view of the OT canon and then that this was (could have been?) part of the ‘cognitive environment’ of early Christianity. It is a helpful historical essay and it engages well with the issue, the arguments and the evidence. Long’s essay is a very general discussion of the problems in contemporary history of Israel study and how theists can engage with the debates. Williams defines the original text, in critical dialogue with B.D. Erhman, as the immaterial text which survives in the manuscript tradition and then mounts a brief 12 point defence of the presumption that the text of the New Testament has been transmitted reliably. Gathercole defends a broad apostolic unity around 1 Cor 15.3-11, and then spends 17 pages defending the apostolic connections to (not necessarily ‘authorship of’) the four canonical gospels. It is interesting stuff, but does Scripture itself claim apostolic authorship for the Gospels? Or is that a product of church tradition? In any case, the relationship between this discussion and the inspiration of Scripture is never articulated. Personally I think I would have been helped more if this question had been asked more often. Fifthly, there is a problem in relation to the chronology of the essays. The original essays were distributed in advance of a conference held in June 2010 and the book is published in 2016. D.A. Carson recognises the problem and suggests ‘most of these papers are sufficiently weighty and robust that they will not quickly become dated’ (p. xvi). The difficulty is obvious - you can’t expect authors to continually up-date essays while waiting for all the contributors to finish up. But the outcome does occasionally look a bit odd because the essays don’t address publications from the last five years, or we get the occasional distracting footnote: ‘Regrettably, I learned of Kevin Vanhoozer’s Remythologizing Theology, Cambridge Studies in Christian Doctrine (Cambridge: Cambridge University Press, 2010) too late to use it in this essay.’ (p. 545) In addition, some topics seem more important now than they did six or seven years ago (pseudonymity, OT text issues, Septuagint). In conclusion, I confess I haven’t yet found this book deeply satisfying. Intellectually, emotionally and spiritually it didn’t engage me in the way I hoped it would. Nevertheless, I’m glad I bought it. I’ve already found several of the essays useful in helping me articulate a high view of Scripture’s authority. I’m sure I’ll refer back to it on a variety of issues. *I have some suspicions about this essay on stylistic and content grounds. It is strange in general that the use of a computer is taken in the public mind as a proof of scholarly thoroughness. Why does the same not hold for the use of a fountain-pen or a typewriter, especially an electric one? Fischer does not think computers hold much promise for questions of authorship. But he is enthusiastic about their use for textual criticism. After so much pessimism we come at last to a field where the computer is of great importance to the student of the New Testament, indeed where it opens up a new dimension and makes possible what hitherto the scholar had not even dared to dream of: that is, in textual criticism. He distinguishes between manuscripts “with all their peculiarities” and the “purely abstract sequence of readings” that can be fed into computers. In textual criticism a strict distinction must be made between the logical, abstract, order and the concrete, historical, order: one might say, between the abstract textual criticism of variants and the concrete study of the tradition which is rooted in the historical environment. The various manuscripts with all their peculiarities and casual errors belong to the concrete, historical, order, and with them the whole indirect tradition in quotations, translations, etc. In the logical order there corresponds to every manuscript a particular series or combination of readings, which are quite abstracted from space and time, from the question of what is true or false, original or derived, given or received. This is not the current distinction between the manuscript and the text it transmits: the text itself is here a purely abstract sequence of readings, not a historical object. So in the logical order we have only sequences of readings, not real but only nominal manuscripts. But these and all their mutual relationships can be represented in quantitative, mathematical, terms in set-theory by means of Venn diagrams. The same holds good for all the groups or sub-groups of these ‘nominal’ manuscripts. And since they can be mathematically represented, they can also be grasped and processed by a computer. Especially interesting is that near the end of the article he anticipates the basic procedure both of the CBGM and Stephen Carlson’s use of cladistic software for Galatians: the computer provides the basic structure of the textual forms and the human editor gives it direction by making judgments about the “truth or falsity of the readings.” In hindsight, it may seem fairly obvious, but this was 1970 and computers were using punch-cards. Two stages must be distinguished. In the first the relations between the manuscripts and the texts are defined on the basis of all their readings, irrespective of whether these readings are true or false: this stage is a purely mathematical process which can be done by a computer—indeed in so complicated a case as the New Testament it should be done by a computer. Then follows the second stage, the proper task of the textual critic, the judgement of the truth or falsity of the readings, the recension of the original text and perhaps also of its more important subsequent forms, and the reconstruction of the history of its transmission. This is a task that only a man can perform: it is beyond the capacities of a computer. But it rests on the firm basis that the computer supplies. Source: Fischer, Bonifatius. “The Use of Computers in New Testament Studies, with Special Reference to Textual Criticism.” JTS 21.2 (1970): 297–308. Just a note to those in or near Cambridge that Codex Bezae is said to go on display today at the University Library. Probably not the page they’ll put on display. I was there a few days ago and saw them setting up, but the displays themselves were off limits. Hopefully I can get over there this weekend to see the great manuscripts. If you’re not in Cambridge, you can still view the manuscript online. All the items on display are available for viewing online as well. Update: I went over today and Bezae is on display along with the other items listed above. 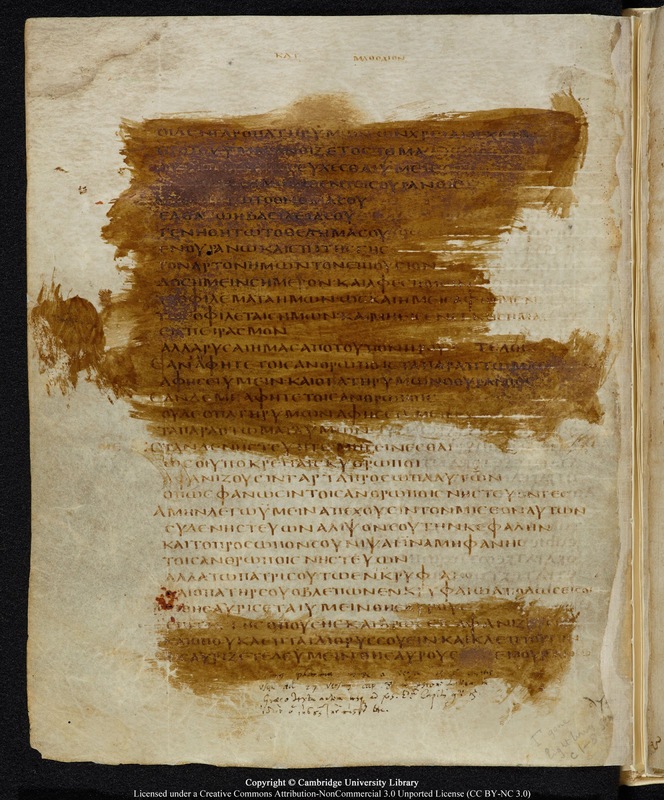 Also Codex Zacynthius, one of two (?) fragments of Origen’s Hexapla, a medieval Hebrew Bible, some papyri and other interesting books were on display. Unfortunately the the three- and four-year-old accompanying me were not as impressed as I hoped so our visit was cut short. I’ll have to go back. I am pleased to introduce our next interviewee in our ETC interviews series. 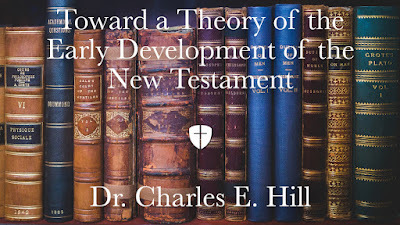 Dr. Charles E. Hill completed his PhD on eschatology in the early Church at the University of Cambridge under Lord Rowan Williams of Oystermouth (yes, they still use such fantastic titles in England). More recently Dr. Hill has turned his attention to issues of NT text and canon in his Who Chose the Gospels? Probing the Great Gospel Conspiracy (2010) and The Early Text of the New Testament (2012) which includes several contributions from our ETC bloggers. He is also a member of the Studiorum Novi Testamenti Societas and is currently the John R. Richardson Professor of New Testament and Early Christianity at Reformed Theological Seminary in Florida. Thanks to Pete Head for some of these questions. PG: Few people probably know that your first degree was in fine art and you worked for a period as a graphic artist (a fine job to have, if I may say so). Is there any particular piece of art that you find yourself coming back to again and again? CH: Not really, though I would say that I find myself being more and more fascinated by the beauty of creation. I can stare at trees and clouds for a long time (hopefully this is not just a sign of aging). I still have favorite artists: Michelangelo, Rembrandt, Dürer, Caravaggio, and now, my kids. Somebody else who heard of my art background and didn’t realize that I’ve been out of it for the past several decades actually invited to give a lecture this spring on Salvador Dali before leading a tour through the Dali Museum in St. Petersburg, FL. That ought to be an interesting experience. Readers of this blog will probably be familiar with your more recent text critical work, but your Cambridge dissertation was on the topic of eschatology in early Christian thought. Having worked on that topic, what led to your interest in textual criticism? In the early nineties I was given a book on the Muratorian Fragment to review. At the time, I didn’t know very much about the formation of the NT canon per se. But having spent a great deal of time in the second century for my dissertation, I found several of this author’s conceptions about the second-century writers to be at odds with those I had developed. The experience of writing that review, along with some other things that were happing in scholarship at about that time (Bart Ehrman’s The Orthodox Corruption of Scripture, for example), convinced me that the issues of canon and text were ones where there might be a real need for scholarship. Shortly after that, I came to RTS, where teaching both NT textual criticism and the NT canon happened to fall to my lot. From very early on I also had an interest in manuscripts. I think the art background was certainly part of that, not only because of the aesthetics of the manuscripts, but also the artefactual, material-culture aspect. 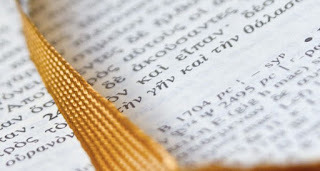 Maybe for all these reasons, and because I was not trained as a textual critic, my particular interest has not been so much on what you might call textual criticism in the traditional sense, the art/science and methods of establishing the text. I’ve been most interested in what happened with the text in the process of transmission, in how Christians were using the text, and in what the NT manuscripts as material objects can tell us about those things. We live in very exciting times, as you know, with more and more discoveries and with the wonderful increased access to digitized images. I hope this will lead to a real renaissance of manuscript and textual scholarship. 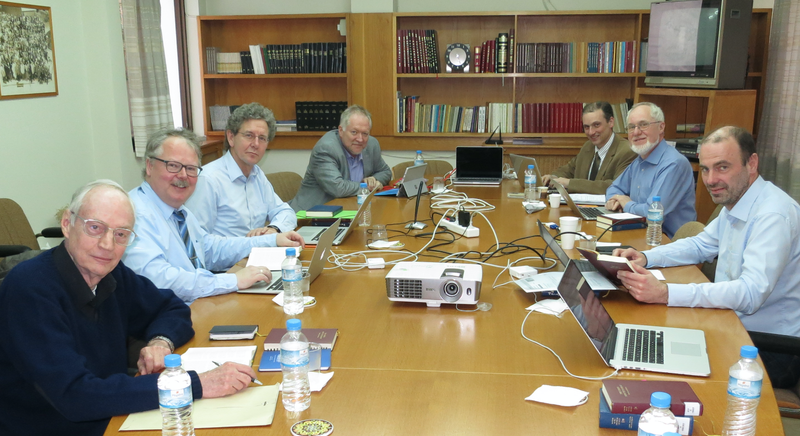 The European Association of Biblical Studies now has a research group focused on fostering cross-disciplinary conversation on the textual criticism of NT, OT and Qur'an. The programme from the website is pasted below. For more details go here. This research group focuses on the textual study and criticism of sacred texts from the ancient Eastern Mediterranean world that later had a global influence; the Old Testament, the New Testament and the Qur’anic text. All three have similarities and differences. They have influenced other writings and at the same time have themselves undergone external influence bearing on questions of interrelationship, orality, textuality and language. Not only the aforementioned characteristics, but also their preservation and the copying as well as the proliferation of manuscripts are of particular interest to textual scholars. Add. MS 9401 f. 3r. Genesis. Dated 1588. 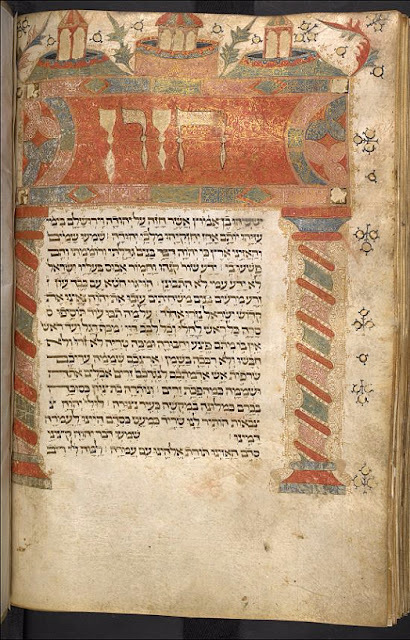 Yesterday the British Library announced that more Hebrew manuscripts have now been digitized. I haven’t found a reliable way to filter for Old Testament manuscripts yet. If someone knows, let me know in the comments. A keyword search for “Hebrew Bible” returned 818 results but plenty of these were false hits. Just poking around though there are some beautiful Hebrew Bible manuscripts in this collection. Add MS 11657 f. 171v. Isaiah. Dated 1300-1399. Add MS 9402, f. 101r. Daniel. Dated 1588. This Summer the Antwerp University Summer School: Book and Culture – Religious Manuscripts, Hand Press Books and Prints (15th–19th centuries): Collections, Materials and Methodologies – will take place on 27 June – 1 July at the Ruusbroec Institute Library. 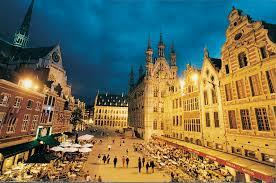 (www.uantwerpen.be/ruusbroec-summerschool). The training will focus on the relationship between the physical object and its metadata, and on “big data analysis” and on other techniques used in the Digital Humanities. Through hands-on sessions in the unique Ruusbroec Institute Library, and visits to three other important Antwerp historic, religious collections, participants will familiarize with religious collections and specific documents. The number of participants is limited to 12 PhD students and postdocs. Admittance will be in order of registration. Master students can register but will only be admitted when the maximum number of participants is not reached. You will receive a confirmation of your admittance before 15 April 2016, which will include further details. For more information, please contact daniel.ermens@uantwerpen.be. Organisers: Louise Blanke, Jennifer Cromwell and Bryan Ward Perkins. 9.10 – 9.30 Introduction by Louise Blanke, Jennifer Cromwell and Bryan Ward Perkins. 10.05 – 10.40 Dorota Dzierzbicka: Monastic vintages. The social and economic role of wine in Egyptian monasteries during the 5th–7th centuries. 11.10 – 11.45 Darlene Brooks Hedstrom: Cooking, Baking and Serving: A Window into the kitchen of Egyptian Monastic Households and the Archaeology of Cooking. 11.45 – 12.20 Gábor Kalla: The refectory and the kitchen in the early Byzantine cloister of Tall Bi’a (Syria). The Egyptian and Palestinian connections. 16.20 – 16.55 Arietta Papaconstantinou: Loans, land, and the Lord: Was credit important for monastic estates? 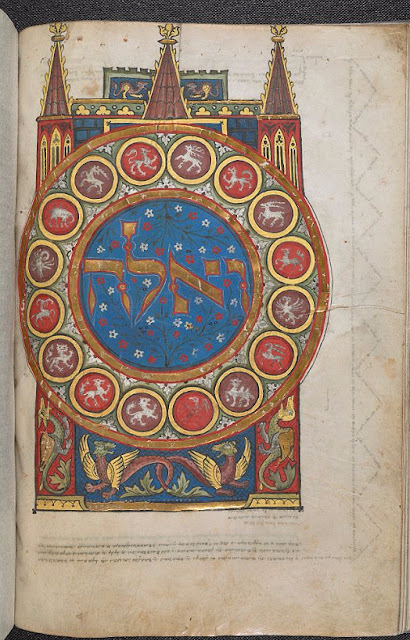 Corpus Library and Archives are delighted to announce the publication of A descriptive catalogue of the Hebrew Manuscripts of Corpus Christi College, Oxford. 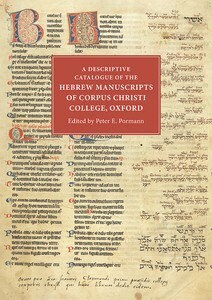 Edited by Peter E. Pormann (CCC 1994), the catalogue complements recently published volumes on the College’s Western and Greek manuscripts. 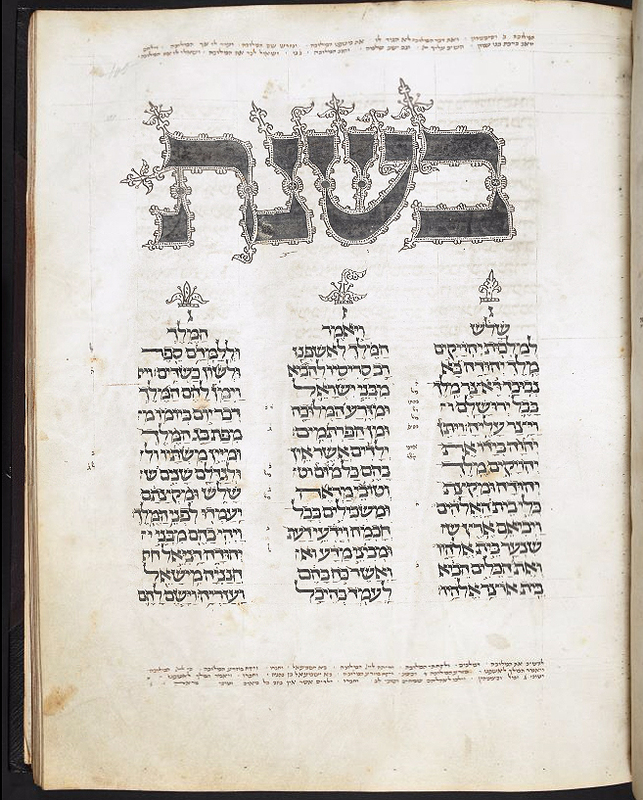 Although few in number, the College’s Hebrew manuscripts are outstanding in rarity and value. At the core of the collection are the seven Biblical manuscripts given to Corpus by John Claymond, each of which features an interlinear translation. 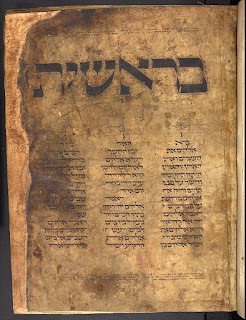 Jewish and Christian scribes produced such texts in a collaborative effort during the mid-thirteenth century to provide tools for non-Jews to learn Hebrew. In addition the collection contains a near complete copy of Rashi’s biblical commentaries, and an Ashkenazi prayer book. In the latter, the owner, a Jew from Spain living in England, recorded different debts owed to him by a variety of Christian dignitaries around the year 1200. He did this in Judaeo-Arabic (i.e. Arabic written in Hebrew letters), and this document is the only one of its kind; no other texts are known to have been written in this language during the entire Middle Ages in the British Isles. 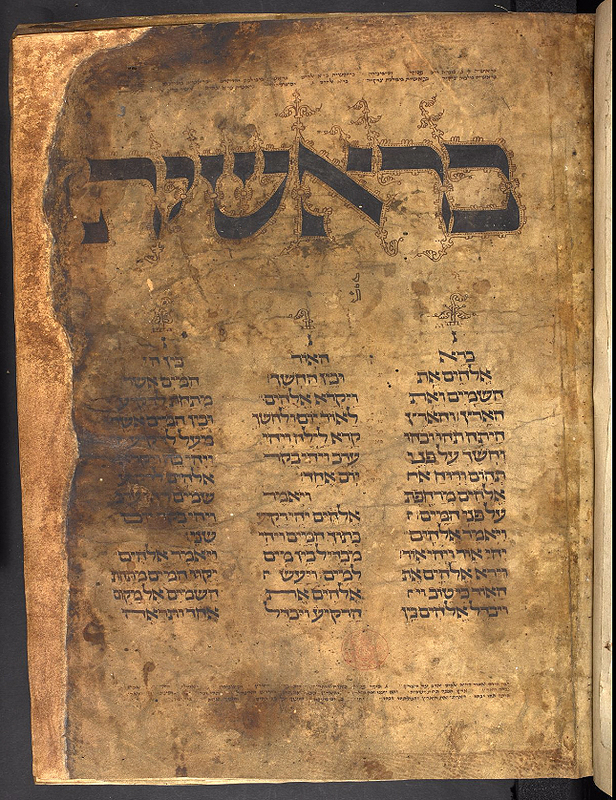 Taken together, the Corpus collection forms one of the most important collections of Anglo-Jewish manuscripts in the world. According to the VMR, Corpus Christi has only one Greek New Testament manuscript (l 2436).